Jews settled in Krakow – near the Wawel Hill – already in the 11th century. Unfortunately, not many documents from that earliest period of the settlement have been preserved. It is only in the materials from mid-13th century where we can find a record about the activities of rabbi Jakub Swara in Krakow. He was known as an eminent scholar, familiar with the entire Talmud. Half a century later, in 1304, the Jewish street, Judengasse (Świętej Anny [St. Anne] Street today) was mentioned for the first time. Further notes concern the Jewish cemetery (1311) and the synagogue (1356). Most of the Jews who were the first settlers in the area came from German territory. They had fled from persecution and were searching for safe living conditions. This influenced their organizational structure and religious tradition. In 1334, king Casimir the Great granted a privilege for Jews from Krakow and the Małopolska region, which guaranteed fundamental rights, including the right to trade and the freedom of religion. This privilege subordinated the Jews to the jurisdiction of the king or voivode. Thirty years later (in 1364), the Krakow Academy (nowadays Jagiellonian University) was established, with the main building located in the Jewish street. Jews had to move to the vicinity of the present Szczepański square and Świętego Tomasza Street. With time, conflicts with townspeople regarding the right to trade in Krakow, became more and more frequent. After the city fire in 1494, which the Jewish community was accused of starting, most of them left Krakow moving to the nearby town of Kazimierz. Kazimierz as a separate town was founded by king Casimir the Great in 1335. The Jews lived there probably from the very beginning, but a written confirmation of this fact can be found only in documents from the 15th century. In the 15th and 16th century new waves of Jewish settlers arrived from the West, especially from Bohemia and Moravia. The Old Synagogue, the oldest preserved synagogue not only in Krakow but also in all of Poland originates from the 15th century as well. Until 1939 it was a major and representative house of prayer. After World War II it was restored and now serves as a Judaic museum. The 16th century began with conflicts between the Jews from Krakow and the Czech Jews. 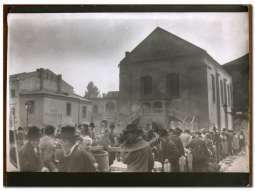 New synagogues in Kazimierz, such as the High Synagogue and Remu Synagogue were built at that time. Also in the 16th century, a new group of educated Sephardic Jews from Italy came to Krakow; they accompanied Queen Bona. In 1578, about 2,000 Jews lived in Kazimierz. With the newcomers, eminent scholars settled in Kazimierz, establishing elementary level schools (Talmud-Torah and cheders) and yeshivas there. At these schools future rabbis were prepared and educated. The first of the great scientists who developed Jewish education in Kazimierz was Jakub Polak (died around 1532), the founder of the first Talmudic academy – the yeshiva. From the days of rabbi Jakub Polak, Kazimierz became a major centre for Judaism, Jewish learning and culture in Poland. In the so-called "golden age", till 1648, the most prominent Jewish scholars worked in Kazimierz. Moshe Isserles (1520? -1572), also known as Remu, whose most famous work is a comment to the code of religious law Shulchan Aruch, also called Mappah. The synagogue at 40 Szeroka Street, which is now a communal house of prayer, bears his name. Other notable figures who, thanks to their presence, made Kazimierz a centre of the Jewish studies include: rabbi and kabbalist Nathan Spira (1585-1633), also known as (from the title of his work) Megale amukot, rabbi Joel Sirkes (died in 1640), a prominent expert on religious law, halakhist, known by the acronym BaCh – from the title of his commentary Bait chadasz – and Jom Tow Lipmann Heller (1578-1654), kabbalist and author of comments on the Talmud and many others. From the first half of the 16th century, first printing houses in Poland, where books were printed in Hebrew and Yiddish, also operated in Kazimierz. The local Jewish community served as a model for other Jewish communities in the Polish kingdom – statute of the community, released in 1595 in Kazimierz, determined the legal provisions for many other municipalities in Poland. The fast development of the Jewish community in the 16th and 17th century can be also confirmed by three new synagogues built at that time. It is worth noting that in the same periode, in addition to six synagogues in Kazimierz, there were also many smaller houses of worship. The deterioration of the situation of the Jewish community in Kazimierz was caused by several factors, including inter alia: the transfer of the capital from Krakow to Warsaw and wars – especially the Khmelnytsky uprising (1648-1655) and the Swedish invasion (1655-1660), during which the possessions of Jews living in Kazimierz were plundered. Among the Krakow's Jews all religious trends and movements known in the Ashkenazi Diaspora were witnessed. In the second half of the 17th century, in the times of crisis, echo of activity of messiah Sabbatai Zevi reached Kazimierz. He won many supporters among the local Jews. This messianic fever was reported in many sources, and its echoes can be found even today, when reading the inscriptions at the synagogue of Isaac carefully. In the 17th century, among the Jewish community in Kazimierz, the influence of the ideas of Haskalah – Jewish Enlightenment and Hasidism –was also visible. Both of these movements were initially suppressed as heretical. At first, in the market square of the Jewish town, Moses Mendelsshon's translation of the Bible, which was regarded as a symbol of the Haskalah, was burned. Then, in 1785, the Hasidic Jews were anathematized, which was publicly announced in the Old Synagogue. With the fall of the Polish Republic the position of Kehilla (community) weakened and Hasidism began to develop with increased force, under the leadership of Kalman Epstein (whose grave is located in the cemetery in Miodowa Street). The years 1772-1776 saw Kazimierz under Austrian occupation, and Krakow was seized in 1776. At the time, there were about 4,100 Jews (about 17% of the population) in these two cities. In 1802, Krakow and Kazimierz were merged into a single urban organism. The Austrian authorities did not respect the previous privileges and statutes which were exercised by the Jews. In the first half of the 19th century Krakow changed its legal status, becoming a part of the Habsburg Empire, then the Duchy of Warsaw (1807-1815) and finally of the Republic of Krakow (1815-1846). Among the Jews in Krakow, traditional Jews were dominant, but an increasingly important role was played by Hasidim and proponents of progress in Judaism, who were in favour of integration with the Polish culture. Representatives of the Jewish intelligentsia began to settle outside of Kazimierz. Assuming the office of the rabbi by Dow Ber Meisels (1798 - 1870) − a religious traditionalist sided with Polish national aspirations − was a watershed event. He took part in many patriotic events. In the 1840s the Religious and Civilization Association was formed. It integrated the Jewish intelligence, striving for integrationism and religious reform (the so-called progressives). In this environment both the idea of construction of the Tempel Synagogue (which was built in the years 1860-1862) and the idea to create the Progressive Israel Congregation in Krakow were developed. This relatively small elite of the Jewish community in the period till 1939 served an important role in the management of the commune. Its members represented the Jewish community also in the city council. The 19th century witnessed conflicts between the supporters of orthodoxy and supporters of modernization, culminating in a term of office of preacher Szymon Dankowicz (1834-1910) at the Tempel synagogue. He delivered his first sermons in Polish and organized patriotic celebrations in the synagogue, with the participation of Jews and Christians. Thanks to the activity of the progressives, more and more members of the community underwent Polonization. Another important period began in 1897 with the arrival of Osias Thon (1870-1936) in Krakow. He initially worked as a preacher, and then as a rabbi at the Tempel synagogue and remains known as the person who brought the Zionist ideology to Krakow. In his activity, Thon stressed that Zionism should develop together with patriotism and love for the country of residence. Over time, he became the undisputed leader of the Krakow Jews. He served many functions, not only in Krakow – he was an MP in the Parliament of the Second Republic, where he fought for the national rights of the Jewish people. In Krakow, he was involved in many projects including: the creation of the Polish-language newspaper of "Nowy Dziennik" ["New Journal"], the Hebrew School, or the Ezra Library. At the turn of the 19th and 20th century, the number of Jews in Krakow increased to 25,000, which accounted for approximately 28% of the total population. Later, the number of Jewish inhabitants of the city was approximately 25% of the population, and in 1931 it was 56,000 people. Most Jews still lived in Kazimierz, but a significant number also moved to the city centre, where the new synagogues and houses of prayer were also established, for example in Grodzka and Szpitalna streets. In the interwar period there was a number of new cultural and social initiatives. Noteworthy is the creation of Hebrew Lower Secondary School, where classes were conducted in Hebrew and the Polish language, and a school for Orthodox girls Beis Yaakov, which were launched in Krakow by Sara Szenirer. Beis Yakov quickly turned into a network of schools, and in Krakow, in Stanisława street a teacher training college was created, where lectures were conducted in a spirit of fidelity to tradition. In Krakow, in the interwar period, all major religious, social and political groups worked actively, which contributed to the creation in the city of a unique blend of Jewish culture in Yiddish, Hebrew and Polish. Krakow was considered the most important centre of the Jewish culture Polonization. During the census, the percentage of Jewish people admitting to use the Polish language was the highest of all the major cities in Poland. Unfortunately, the process of flowering of the Jewish culture and acculturation was brutally interrupted by the Holocaust. On the basis of: Hanna Zaremska, "Żydzi w średniowiecznej Polsce. Gmina krakowska", Warsaw 2011; Majer Bałaban, "Historia Żydów w Krakowie i na Kazimierzu 1304-1868", vol. I-II, Krakow 1931; "Polin. Studies in Polish Jewry", vol. 23. "Jews in Krakow", ed. Michał Galas, Antony Polonsky, Oxford 2011.